At the Joukowsky Institute for Archaeology and the Ancient World, all Ph.D. candidates defend a prospectus outlining their dissertation plan in the fall of our fourth year. My dissertation prospectus grew out of my preliminary exams, defended successfully in the spring of 2011. I developed the the prospectus over the course of a summer fellowship at Dumbarton Oaks Research Library and Collection in Washington, DC. Below, I've pasted the introduction to my prospectus, which I defended successfully in November 2011. To read about the various case studies, click on the title above to download a .pdf version of the prospectus. Pilgrimage—for whatever intangible motivation—had very tangible requirements and very decisive impacts on local economies and settlement patterns, as well as on religious practice. Conversely, what existed ‘on the ground’ to a great extent shaped the practice. Data exist to illuminate this dialectical relationship between pilgrimage and its physical infrastructure; with those data in hand, it is possible to provide one route through which to see the past. Pilgrimage in the eastern Mediterranean, at the end of antiquity and the early centuries of what is now known as the Byzantine period, was a booming phenomenon. One type of pilgrim discussed often, because of visibility in the textual record, is the holy man as pilgrim. This type of pilgrim certainly did exist, but there are other pilgrims who show up in the material and textual record as well: the lusty pilgrims of Mary of Egypt’s boat-to-Jerusalem fame, the panegyris-frolickers decried by Gregory of Nyssa, the merchant-pilgrims who took advantage of those same ‘religio-commercial’ fairs and markets that occurred on the saints’ feast days, or those who came to be healed or become pregnant or who sought the resolution of a dispute over issues almost entirely unrelated to the holy man at his shrine. From holy man to health seeker, what is common to all these figures is their journey to a sacred destination. Archaeological and textual sources do not always allow us to reach them directly, but it is possible to outline the infrastructure of the world – the real world – through which they journeyed. The archaeological record can provide an image of pilgrimage, with material culture as fleeting glimpses, of a nexus of practices that, viewed in isolation, are indistinguishable from another, but when viewed in their wider context can be pieced together as pilgrimage in its material context: “In pilgrimage, social practices such as religious veneration, travel, and commerce gave rise to concrete organizational forms, such as shrines, roads, hostels and artisans’ shops.” It is within this context that a landscape archaeology approach to early Christian pilgrimage is perfectly poised to make a contribution to our knowledge of that wider world. Roads and pilgrimage are often discussed in conjunction, but usually conceived as abstractions. There are few who would argue against the notion that the two are inextricably related, but, until very recently, even fewer who have undertaken to study that relationship from the perspective of landscape archaeology, placing both pilgrimage and the infrastructure that pilgrims utilized in their wider, contemporary material realities. When discussed separately, pilgrimage emerges as a religious abstraction, with the literature focused on motivation and destination; when material is engaged, it usually has to do with the iconography of the souvenirs they carried home with them, or the flow of pilgrims through a particular and bounded architectural space. At the opposite end of the spectrum, roads appear as functional lines through a landscape, usually within the context of long-distance economies; or as ideological stamps relating to the spread of imperial Rome beyond peninsular Italy. Partially, this is a function of the way archaeology is traditionally practiced, with an emphasis on distribution maps and diachronic layering of features. In this approach, connectivity is interpreted from findspots of different categories of archaeological material, not physical connections. When roads are explicitly identified as connections, the goal is simply to find out where the road leads to, from where, and since when. When that level of information has been discerned, the matter is considered finished. These observations are oversimplified for the sake of brevity, and there are of course exceptions, but such a general sense is evident in the tradition of scholarship on the two subjects. Nevertheless, just as traditional scholarship has always adhered to the theoretical and methodological issues driving contemporary research, those issues inevitably shift over time. Since Stopford’s much-cited 1994 article arguing for an archaeology of pilgrimage as a subdiscipline in itself, innovation and progress in the broader field of archaeology – particularly in landscape archaeology and remote sensing techniques – continue to influence the direction that an archaeology of pilgrimage can and will take. It is from point of departure that this dissertation aims to explore notions of movement and connectivity in the late antique and early Byzantine world, as seen in their material and physical manifestations, and through an early Christian pilgrimage lens. By definition, pilgrimage as a process was bound up in bodily movement, necessarily involving the infrastructure required to travel through the ancient world: roads, certainly, but also bridges, boats, lodging, and water supplies for both people and animals, to present a less than exhaustive list. Beyond the simple provision of means of transportation, items such as food, clothes, and money were also necessary for a journey to be completed successfully. These items in turn required venues for acquisition, such as markets, at which items beyond those of necessity could also be procured (such as pilgrimage souvenirs). For whatever reason pilgrims might have undertaken pilgrimage, over distances great and small, both literary and archaeological remains make it clear that “not only were numbers high but also that pilgrims were profitable.” But what are the implications of such high numbers of pilgrims – and, potentially, large profits – on the local communities? No matter the motivations behind pilgrimage, whether it had to do with healing, or penance, or adherence to tradition, the pragmatics of pilgrimage were just as much a part of process as any individual pilgrim’s spiritual ideals. One thing becomes very clear: pilgrimage was grounded in the daily life of the world in which it took place. Stopford’s advocated approach to studying Christian pilgrimage – considering “the assemblage of pilgrimage in its entirety, with routes, buildings, monuments, landscapes and artefacts all relevant to the theme” – is a useful one for seeking new ways to think about the phenomenon. The materiality of an early Christian pilgrimage industry established particular shrines not just as destinations for pilgrims seeking sanctity or spiritual renewal through proximity to a saint, but also as places “charged with economic and social activity of a multitude of kinds.” This, in turn, created a pilgrimage industry of sorts; and thus it is clear that pilgrims in the ancient world negotiated not just the spiritual realm, but the contemporary political, economic, and historical world in which it took place, which in turn grew up around the practice of pilgrimage itself. This dissertation aims to explore that negotiation between the phenomenon of early Christian pilgrimage, the infrastructure of travel and communications, and the landscape and communities in which it took place. How can we observe the negotiation archaeologically; what different material proxies can fill out the picture of pilgrimage and movement on a regional and local level? What can we glean from relevant texts about pilgrimage as an industry, as a religious undertaking, as a community practice, when most pilgrims remain “nameless, faceless, and uncountable”? How does such a two-pronged undertaking impact the wider fields of late Roman and early Byzantine landscape history and landscape archaeology, both methodologically and theoretically? The beginnings of a particularly Christian form of pilgrimage, albeit a practice with pre-Christian precedents especially in the healing cults of major Greek sites like Epidauros, Claros and Kos, are bound up in the changing conceptions of Christian holy places with the cult of relics and holy men. In recent decades, discussions of sacred space in the late Roman and early Byzantine empire have noted the transition from a conception of the uniformity and universality of God-in-space to the burst of saints’ cults in specific places, and subsequently the rush of pilgrims to visit them, beginning in the fourth century and continuing throughout the entirety of the medieval period. In the earliest centuries of documented pilgrimage this was very much a spontaneous exercise; there existed no obligation in the new Christian tradition for pilgrimage to the holy places, as seen in the injunction to visit the Temple in Jerusalem annually for Judaism (Exodus 23: 17, 34:23; Deuteronomy 16:16) and the Hajj to Mecca in Islam (Quran 22: 27-30). Inevitably, however, authoritative control over those Christian holy places developed over time. How those places acquired sacred status, and how and who visited them, was gradually, but increasingly, administered by church and state authorities. Most of the textual evidence recording the earliest Christian pilgrims (4th century CE) indicates Jerusalem and the holy places of the Old Testament as the destinations, though some pilgrims, such as the well-known Egeria, ventured out to shrines outside the Holy Land – for example, the shrine of Saint Thekla near Seleukeia. Some scholars have argued that the designation of Christian sacred places outside the Holy Land itself were appropriations of the well-known sacred spaces of the pre-Christian traditions, and were established as a result of the seventh-century invasions and the subsequent difficulties of pilgrimage to Jerusalem. This is based, at least in part, on the notion that the Holy Land itself, where the biblical and New Testament events were thought to have taken place, lent itself to a particular kind of sacred space (and thus a pilgrimage experience specific to the sacred spaces in Palestine). Recent approaches to the history and archaeology of the early Christian Roman world show that such one-to-one correlations no longer stand up to prolonged scrutiny. Certainly much more was at stake than the ‘victory’ of one religion over another, especially with the ramifications – social, economic, political – of pilgrimage for those sites which became well-known and highly visited, on both long-distance and local scales, from the early days of their foundation. In this way, the nature of these newly ‘discovered’ sacred spaces was intimately tied to travel and communication routes and infrastructure: either the routes and infrastructure that were already in place before the establishment of a pilgrimage destination, or the routes and infrastructure that were built and maintained in order to accommodate the traffic that those pilgrimage sites engendered. The issue of maintenance is particularly salient in the historical context of the declining standards of roads in late antiquity. Thus, this dissertation adopts a methodological approach that takes the archaeological investigation of these infrastructural features and situates them within known patterns of pilgrimage. Problematic for an archaeological study of travelers is the inability to distinguish between ‘types’ of traveler through the remains that can be found either on the ground or in it, except through very particular and unfortunately rarely found types of evidence such as pilgrimage ampulla. This acknowledgment, however, raises two important points: one, that it was a rare ancient traveler, Christian or otherwise, who could be considered of a certain ‘type’ – for instance, there was not always, or even usually, a marked difference between a pilgrim or a merchant or an ambassador or a sailor or a soldier in terms of where and how they traveled, and what they took with them or brought back. On the level of more local travels, this ambiguity of purpose would have been even more pronounced. Secondly, as informative as an archaeology of pilgrimage on a local or regional level may be on its own terms, it cannot be productive in a literary and epigraphic vacuum. Itineraries, hagiographies, inscriptions, and descriptions in other sources are rich sources for the study of early Christian pilgrimage, and this study will draw on textual sources referring to pilgrimage, roads, accommodations, and the destinations themselves. 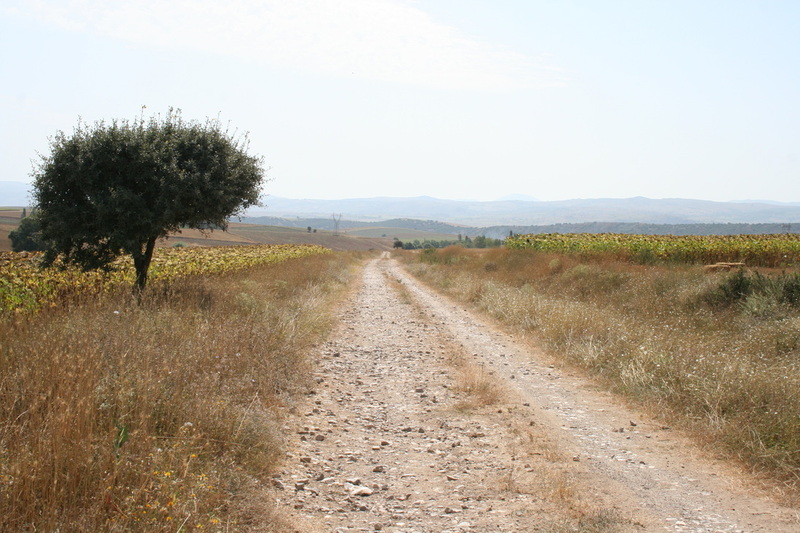 As the aim of this dissertation is to study the potentially diverse forms and implications of early Christian pilgrimage – albeit situated within a wider social, economic, political and religious world – caution is necessary in order to avoid the potential danger of extrapolating what may have been an exceptional experience into a paradigm for pilgrimage. Just as texts provide glimpses of pilgrimage at a particular time and in a particular place, the archaeological record provides glimpses of various pilgrimage activities at particular places and times. Examining the two in conjunction makes it possible to weave together a larger picture of early Christian pilgrimage in all its diverse forms. Thus, this study is focused on pilgrimage, rather than an attempt to trace out the specific journeys of individual pilgrims, about whom so much has already been written. Situating the infrastructure of pilgrimage within the framework of the wider workings of a regional landscape can do much to fill in gaps of knowledge about early Christian pilgrimage in particular, as well as the wider eastern Mediterranean world in general at a time of often radical changes; changes that can be seen in all accounts, from archaeological to textual to epigraphical. But there were many aspects of life that were similar to the centuries and millennia of habitation and movement that had come before. Local economies, changes in settlement pattern as well as in the infrastructure required to move between settlements, and religious practice all affected how early Christian pilgrimage was undertaken. In turn, the practice of pilgrimage contributed to the forms that those economies, settlement patterns, and religious practices developed and changed – or not – over time. Recognition of the dialectical relationship between pilgrimage and its physical infrastructure provides a foundation on which to base an investigation of routes in the landscape, and the movement of people and goods that routes facilitate. The landscape provides the context for identifying the relationship, and movement is the lens through which to approach both roads and pilgrimage. The aim of this approach is to gain a better understanding of the landscape itself; it has long been established that the landscape is not simply a backdrop to the processes of human life. Routes, like those activities, are deeply immersed in it, and a better understanding of how and why people moved through it, along those routes, will potentially lead to a better understanding of landscape. In an attempt to piece together the ancient landscape, routes are an integral facet: they hold the world together, in all its various parts – social, economic, cultural, political, military, agricultural, religious, and so on – through the movement they facilitate. But the roads themselves were not the only elements of routes. They, and their associated infrastructure, were embedded in the landscapes through which they ran. In the end, “the point is precisely that [the road] is indivisible from the broader canvas” of the landscape at large. This is not simply a physical integration, but a conceptual one. Inclusion of these elements is particularly necessary in the attempt to avoid creating a false dichotomy between the journey and the destination, which is not especially useful in conceptualizing the importance of movement through a landscape, whether for the purpose of pilgrimage or trade or agriculture. Routes render that dichotomy invalid, through careful examination of the patterns and infrastructure that constitute connectivity. Identification of those patterns and infrastructure reveals in a very tangible and explicit way why, and how, routes and their infinite ‘destinations’ are inseparable, not just in the practice of pilgrimage and travel but also in topography, settlement patterns, political structure, religious practice, and so on. Pilgrimage was a dynamic process, both in its undertaking and in its development as an institution and practice over time. That same dynamism applies to the very infrastructure in which it occurred, a point that is often glossed over in traditional discussions of roads. In this sense, a road, once conceived as a single feature, can no longer be something this is necessarily considered as an holistic entity, static in both purpose and morphology along the length of its entire course. Innovative projects like Gibson’s systematic survey and mapping of roads and paths in the Palekhori region in Cyprus holds much potential for taking these variations into consideration and as a lens through which to study movement along those routes. Through that lens, there is an opportunity “to gain some understanding of the importance of specific routes and the direction that people moved through the landscape.”  It is about roads in their local context; landscape as a regionally diverse setting of dynamic processes and relationships, not a static collection of generic features. An investigation of roads highlights the dynamism of those landscapes. Theodore of Sykeon; Paula; Jerome; Paulinus of Nola; etc. Mary of Egypt, a self-described nymphomaniac, gained passage to Jerusalem by offering sexual favors to – and perhaps even forcing herself upon – the pilgrims on a ship bound to Jerusalem for the feast of the Exaltation of the Holy Cross. See the Life of St Mary of Egypt 18-21, trans. Maria Kouli 1996: 80-82; see also the Latin version from Paul the Deacon (after Sophronius), Life of St Mary of Egypt 13-14, trans. Benedicta Ward 1987: 44-46. Bitton-Ashkelony 2005: 51-57; in the Life and Miracles of Thekla, “One man commented on the fact that he was most inspired by a beautiful young woman that he saw during the celebration and was consumed by the thought of having his pleasure with her so that he could only offer prayers to this end” (Vryonis 1981: 201, qting from Dagron 1978: 378). In my dissertation introduction, I will work through definitions of ‘pilgrim’ and ‘pilgrimage,’ the development of the term, and its use throughout and since late antiquity. Exceptions include, for Christian pilgrimage, French’s (1981) RRMAM: The Pilgrim’s Road, and more recently, Candy 2004, 2009; Bangert 2010; Schachner 2010. For the archaeology of the pilgrim route of the Hajj to Makkah, see Tate 2007; al-Resseeni et al. 1998. The contributions to Elsner and Rutherford (2005) are text-heavy approaches that do address material aspects of early Christian pilgrimage. The political, theological, and cultural realities in which early Christian pilgrimage developed have seen much more attention. See, among others, Dietz 2004; Bitton-Ashkelony 2005; Johnson 2008. Vikan 2010; for a critique of this approach, see Anderson 2004 and 2007. For example, Elsner and Coleman (1994) at Sinai; Stevens (2005) at Bir Ftouha. See especially Trigger 2007 and Johnson 1999; refer also to ‘State of the Field,’ below. For example, Anderson’s (2004 and 2007) new approach to ampullae is situated within developments in ceramic production studies; Snead et al’s (2009) work on roads is based on new ways of thinking about movement and archaeological landscapes. “Early Christian pilgrimage involved a journey to a place in order to gain access to sacred power, whether manifested in living persons, demarcated spaces, or specific objects. Movement toward the sacred site, as well as ritualized movements once at the destination (such as processions, ascents, descents, and circumambulations) shaped pilgrimage” (Frank 2008: 826). Stopford 1994: 57; my emphasis. Candy 2004: 1. The wide-ranging social backgrounds of the possessed population in the 7th-century miracle of Theodore of Sykeôn are just one clue to this wide range, enumerated in Mitchell 1993 II: 141: “With the exception of three of of the women and two of the children, the sufferers were not from Theodore’s immediate locality, the villages of north-west Galatia, but from larger cities which he visited or where he had connections: two children of Ancyra, a cleric and his wife from Iuliopolis, a paralsed man at Apollonia-Sozopolis in south Phrygia, five persons from Nicomedia and its neighbourhood, and the rest, ten cases in all including the slaves, from Constantinople.” Foss (2002) supports this notion: “It is clear that masses of people were involved in pilgrimage in all periods… Most of them, at all times and in all shrines, were certainly local people, overwhelmingly peasants” (146). Following Maraval, this dissertation does not focus upon “that form of pilgrimage closely associated with the ascetic life, the xeniteia both advocated and lived by certain monks of the early Christian centuries” (2002: 63); in other words, the holy man as pilgrim (see discussion on p. 2). Limor 200X: 328. Maraval supports the fourth century date for the watershed in the requisite development of the “veneration of object and place” (Maraval 2002: 65); and it was during the fourth century that the term ‘holy places’ (ὁ ἅγιος τόπος, o agios topos) was first used by Constantine in a letter to Makarios, the Bishop of Jerusalem (Eusebios of Caesarea, Vita Constantini, 3.52; cited in Maraval 2002: 67). Elsner 1997 links the Life of Apollonius of Tyana with “localized pilgrimage literature in the Second Sophistic” (Johnson forthcoming DOP: 1). Elsner 1992 cites the “surprising continuities between pagan and Christian culture, but also some profound differences in how the holy was perceived and experienced” (3). Brown 1981; Maraval 2002; Frank 2008; among others. Limor 2006: 326. “The supposed conflict between the original ‘spiritual’ concept [of the uniformity of sacred space] and developments in reality remained an unsolved problem of Christianity for ages, and thus it is no wonder that criticism of pilgrimage was born with the phenomenon itself.” See, among others, Bitton-Ashkelony 2005; Frank 2008; Brown 2008. See below for a more extended discussion. One of the main proponents for the development of this Christian sacred topography, especially in Egypt, was the rise of the holy man. Since Peter Brown’s first publication on the holy man in 1981, the bibliography on the topic is now, as Bitton-Ashkelony aptly put, huge (2002: n. 4). Maraval 2002: 64; Bitton-Ashkelony 2005: 30. Dietz 2004; see Bitton-Ashkelony 2006 and Elsner and Rutherford 2005 for discussion of the diversity of pilgrimage practices. In the introduction to my dissertation, I will be working through different terms – like pilgrimage (see n. 5 above), sacred, and Holy Land – to both problematize them as well as explain my own understanding and use of them. R. Falcasantos has suggested that I use Palestine, as the name of the Roman province, instead of Holy Land. Eg. 22.2-23.6, trans. Wilkinson 1999: 140-141. These scholars see the reuse of pre-Christian buildings – whether religious in function or not – or even just their spolia, = as the conscious manifestation and visual display of the triumph of Christianity over paganism (Saradi 1997: 395; Deichmann 1939; Hebert 2000). Contra, as it stands now, of Bitton-Ashkelony 2002, who suggests that pilgrimages of different kinds – she does not mention different places within the sacred topography – are a “basically similar religious phenomenon” (2). Thinking of my own work on the temple-church conversion at Aphrodite, but should cite actual published arguments as well; check Papalexandrou, etc for detailed references; for textual approaches to this adoption of sites, see Johnson forthcoming DOP : 9. It has been cautioned that even pilgrimage ampulla should not be correlated with the journeys of individual pilgrims but rather considered more indicative of contacts between the object’s point of origin and its findspot, or even of modern collecting habits (Anderson 2007). On this first point, see more below. For recent work on situating pilgrimage within a landscape perspective in the medieval West, see Candy 2004; 2009. Foss 2002, for example, suggests that pilgrimage was sometimes “only an incidental motive” (146) to other purposes for travel, such as a for sailors, mercenaries, merchants, etc. Rutherford 2009 discusses Greek theoric networks in which envoys can be envisioned as pilgrims; Elsner and Rutherford 2005 give examples of travelers who did more than just business. Constable 2003 and McCormick 2002 provide later examples, though with a heavily western bias. As has been noted, “The literary choices [in the Life and Miracles of Thekla]… do, in fact, offer a window on the plain of Seleukeia in late antiquity, but this window is the one through which the author has decided we should look” (Johnson 2006: 171). references to books on Egeria, Piacenza, etc. Horden and Purcell 2000: 91. More recent scholarship on the archaeologies of movement and mobility has the potential to shed light on the role of movement through a landscape. See Snead et al 2009; Ingold XXXX; Sellet, Greaves, and Yu (eds.) 2006; Barnard and Wendrich (eds.) 2008. There is a strong focus on mobile horticulturalists, pastoralists, and hunter-gatherers in this literature. See below for an extended discussion of connectivity. Spirn 1998: 133; cf. Graham 2006: 47. In the fourth century CE, Gregory of Nyssa wrote that pilgrims poured in from all over the Mediterranean to the shrine of St. Theodore of Euchaïta in north-central Anatolia, such that “the thoroughfare that leads to this place preserves a resemblance to a group of ants: among those who are moving along it are both those who are arriving and those who are leaving.” This evocative description is just one indication of the burgeoning number of Christian pilgrims in the eastern Mediterranean in late antiquity and the early centuries of the Byzantine period (4th-7th centuries CE). Oddly missing from most scholarly discussions of this well-known practice, however, is any sense of its material correlates and context: how such journeys took place and how such destinations were affected and reconfigured. Archaeological and textual sources do not always allow us to access and understand pilgrims directly, but it is possible to outline the infrastructure of the world—the real world—through which such travelers, religiously motivated or otherwise, journeyed. The sheer materiality of early Christian pilgrimage—both the wherewithal required to make the journey, and the necessity of physical contact with the sacred relic or holy man—lends archaeology immediate relevance to its study as both lens and framework for exploring travel, movement, and landscape in the ancient world. By definition, pilgrimage was bound up in bodily movement, necessarily involving the complicated infrastructure required to travel often long distances through the ancient world (from Constantinople to Antioch, for example, or from Spain to the Sinai). It is from the perspective of travel infrastructure that my project aims to explore notions of movement and connectivity in the late antique and early Byzantine world, and through the lens of early Christian pilgrimage. No matter the motivation, whether it had to do with healing, penance, or adherence to tradition, the pragmatics of pilgrimage were just as much a part of its undertaking as any individual pilgrim’s spiritual ideals. The research proposed for this fellowship expands upon work already undertaken for my dissertation. Approaching early Christian pilgrimage as a diverse phenomenon with locally specific aspects, I examine four case studies of pilgrimage destinations and their surrounding regions in Anatolia: the basilica of St. John at Ephesos, the pilgrimage shrine of St. Theodore at Euchaïta, the church of Michael the Archangel in Germia, and the shrine of St. Thekla near Seleukeia. Situating pilgrimage within a local context and investigating it on a regional scale has the potential to be informative not just about the religious practices of early Christian Anatolia, but also about contemporary regional economies, settlement patterns, and interactions between the pilgrims and communities in which they stopped. The annual panegyreis, markets or fairs, held in conjunction with saints’ days at Christian shrines, for example, contribute to a more complex picture of the impacts of pilgrimage on a community. The case studies incorporate various types of evidence: Ephesos, for example, has seen over 100 years of excavation by the Österreichisches Archäologisches Institut, while Ayatekla has a rich textual tradition. Euchaïta, in recent years, has been the subject of a regional survey, the Avkat Archaeological Project (AAP), in which I participated as the project’s Geographic Information Systems (GIS) specialist, and under whose auspices I conducted fieldwork on routes in the immediate survey area. This fieldwork is in preparation for a chapter on travel and communications in the AAP’s final publication. Mitchell (1993) has suggested that the pilgrimage church built by Zeno at Ayatekla and the Justinianic Michaelskirche in Germia are each others’ closest equivalents, and thus are set up for productive comparison. The late antique boom in church construction was indeed an integral part of the changing definitions of sacred space in the earliest years of the period under consideration in this project (roughly, the 4th-7th centuries CE). Much energy will be directed toward situating the pilgrimage churches within the archaeologically detectable infrastructure—including the complexes of which the pilgrimage churches themselves were a part—and in relation to relevant literary sources for the region embracing a given pilgrimage destination. Within those parameters, the definition of the geographical extent of each case study’s area will vary depending on the amount of published and ongoing fieldwork, and will inevitably be reassessed upon further analysis during the course of my research. My research will include the compilation of the various features that comprise travel infrastructure (writ broadly) within these four case studies: roads, bridges, water sources, travelers’ accommodations (hostels and monasteries), milestones, tetrapyla, and city gates, and will attempt to corroborate existing textual documentation with features identified on the ground. These data will form the basis for spatial modeling in a Geographic Information Systems (GIS) environment. Beginning in June 2013, I will undertake survey and mapping research at Ephesos under the auspices of the current project of the Österreichisches Archäologisches Institut. I will focus on the city’s pilgrimage sites, including the basilica of St. John on the Ayasoluk hill and the Cave of the Seven Sleepers, as well as the numerous churches and saints’ tombs located in the city and its environs. Through the documentation of their infrastructural development in the late Roman and early Byzantine period, I will examine how urban layout and organization facilitated the movement of pilgrims. A consideration of how pilgrim traffic affected the civic landscape, its organizational structure and its development (and vice versa) will anchor early Christian pilgrimage within the historical, political and religious context of the city of Ephesos. In addition to fieldwork at Ephesos, during the course of the 2012-13 year I will visit the destination sites of my three other case studies, as well as other sites that provide potential comparanda. These include: in Turkey, the pilgrimage sites of St Timothy at Hierapolis and St Symeon the Younger at Antioch, as well as the debated pilgrims’ accommodations at the Alahan monastery northwest of Seleukeia; and in Jordan, the pilgrimage destination at Jabal Haroun, Madaba, and Petra. Other elements in the pilgrimage landscape, such as the Greek pandocheion (hostel, or inn, such as the Late Roman inn located by Mango in southern Turkey), will be studied in their role as material indicators of punctuated movement across the landscape. My autopsy of these sites will culminate in a period of intense research and synthesis over the course of the late fall of 2012 and early spring of 2013. At this point I will add in my additional case studies, drawing where possible from published work and shared data from more recently completed projects (Germia and Euchaïta). Other dimensions of this work will include collecting and synthesizing information about distributions of Christian pilgrimage souvenirs, such as flasks and tokens, as indicators of production, consumption, and connection, and incorporating contemporary pilgrimage texts. In-depth library research, coupled with my visits to the various sites, will allow, during the course of my fellowship at K0ç University's Research Center for Anatolian Civilizations, an intensive analysis of travel infrastructure patterns and developments on a microregional scale through spatial analysis and modeling in a GIS environment. Any resulting models will be used as a guide in the identification of actual patterns of travel and travel installations on the ground in the region of my case studies, to be revisited and ground-truthed over the summer of 2013. Comparison of GIS results with those elements located on the ground will illuminate the patterning of travel infrastructure and the implications for the contemporary landscape. This component of the project more generally explores the role of spatial modeling in landscape archaeology, including its limits and its benefits. It also contributes to further developing innovative methodologies for incorporating documentation of travel infrastructure into more traditional styles of landscape archaeology in Anatolia, as recently demonstrated through comparable interpretations of ancient roads in Egypt and Cyprus. Gregory of Nyssa, On Theodore the Recruit 69.3. Translated by Johan Leemans in ‘Let Us Die That We May Live’: Greek Homilies on Christian Martyrs from Asia Minor, Palestine and Syria (c. AD 350-AD 450), by John Leemans, Wendy Mayer, Pauline Allen and Boudewijn Dehandschutter. London and New York: Routledge, 90. Vryonis, Speros Jr. 1981. “The Panegyris of the Byzantine Saint: a study in the nature of a medieval institution, its origins and fate,” in The Byzantine Saint: University of Birmingham Fourteenth Spring Symposium of Byzantine Studies, ed. Sergei Hackel. Studies Supplementary to SOBORNOST 5. London: Fellowship of St Alban and St Sergius, 196-228. Craft, Sarah. In preparation. “Travel and Communications,” in Euchaïta: A Late Antique and Byzantine City, ed. John Haldon, Hugh Elton, and James Newhard. See also: Elton, Hugh, John Haldon and Jim Newhard. 2009. “The Avkat Archaeological Project, 2007-2008,” Araştırma Sonuçları Toplantısı 27.3: 29-51. Mango, Cyril. 1986. “A Late Roman Inn in Eastern Turkey,” Oxford Journal of Archaeology 5: 223-231; Niewöhner, Philipp and Klaus Rheidt. 2010. “Die Michaelskirche in Germia (Galatien, Türkei): Ein kaiserlicher Wallfahrtsort und sein provinzielles Umfeld,” Archäologischer Anzeiger 1: 137-160. Mitchell, Stephen. 1993. Anatolia: Land, Men, and Gods in Asia Minor. Volume 2: The Rise of the Church. Oxford: Clarendon Press, 117. “The increase in the number of Christians during the third century, which was particularly marked during the second half, the period of the so-called truce of the Church, and the corresponding construction of places of worship, necessarily favored this tendency toward the sacralization of persons and places” (Maraval, Pierre. 2002. “The Earliest Phase of Christian Pilgrimage in the Near East (before the 7th Century),” Dumbarton Oaks Papers 56: 66). For a recent publication on the archaeology of early Christian pilgrimage sites in Jordan, see Burton MacDonald. 2010. Early Christian Pilgrimage in Jordan: A Literary and Archaeological Guide. Oxford, UK: Oxbow Books. Mango, Cyril. 1986. “A Late Roman Inn in Eastern Turkey,” Oxford Journal of Archaeology 5: 223-231. For Egypt, see Gates, Jennifer. 2005. “Hidden Passage: Graeco-Roman Roads in Egypt’s Eastern Desert,” in Space and Spatial Analysis in Archaeology, ed. Elizabeth C. Robertson, Jeffrey D. Seibert, Deepika C. Fernandez, and Marc U. Zender. Calgary, AB: University of Calgary Press, 315-322; for Cyprus, Gibson, Erin. 2007. “The Archaeology of Movement in a Mediterranean Landscape,” Journal of Mediterranean Archaeology 20.1: 61-87.